I haven't done a Saturday Steam roundup of random whanot in a while, so prepare for an onslaught of steamy goodness! - Hannah F. found a flash program I had way too much fun playing with: a steampunk "costume creator:"
The program was designed and created by DeviantArt user Ammotu, and you can play it here. 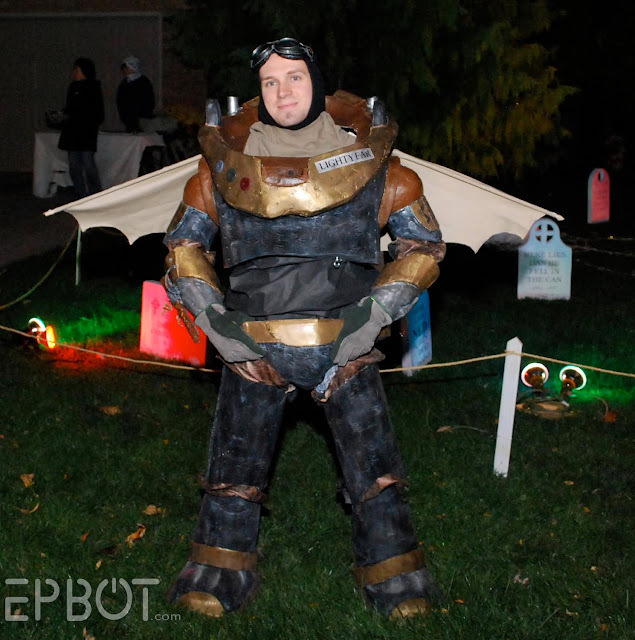 - Speaking of costumes, who wants to see Epbot reader Jason dressed as steampunk Buzz Lightyear? He tells me my photos of the steampunk Wizard of Oz gang helped give him the idea. Ah, I love having a part in inspiring greatness like this. More info at the film's website. And now for a little whimsy! 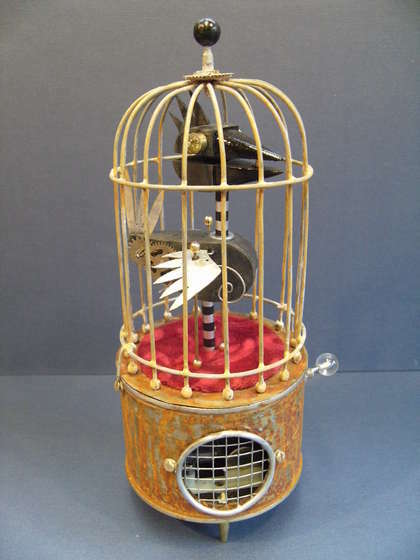 Eric found this DIY Steampunk Singing Bird over on Instructables, and I totally want to make one. Isn't it amazing? Kind of a clockwork Tim Burton vibe. Hit the link for in-process photos and instructions, and then visit creator Keith Newstead's site for tons of jaw-dropping automatons. The bird's movements are astoundingly lifelike - if nothing else, go to 1:25 on the video below to see it in action. You will be amazed. 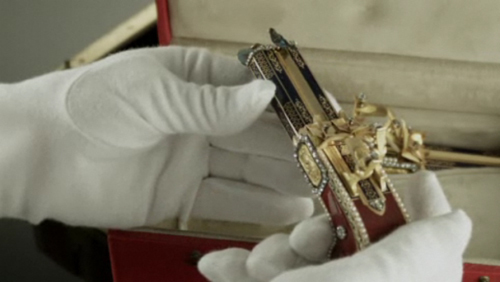 Especially when you consider these were made in 1820. The pistols sold last month at auction for over five million dollars. WOW. Visit Christie's for more info. - And finally, there's a steampunk group planning an airship Nautilus float for the New York Mermaid Parade next year. Awesome, right? If you want to get involved (or chip in for supplies) head over to their Facebook page. Well, I think that's enough for today - the rest will have to wait 'til next week. Hope you guys are having a great holiday weekend! It is what I am doing this weekend. It promises to be nerdy, fantastical, and at least somewhat steamy. I absolutely love automatons. Have you read The Invention of Hugo Cabret? The imagery in that book is amazing, and it has cemented my wonder at the automatons of the 19th century. Automatons that write poetry and draw? Yes, please! Awesome stuff (but be sure to check out the links in the back of the book for the real-world automaton that inspired the book). Good grief, woman!! How can you find so much amazing stuff? 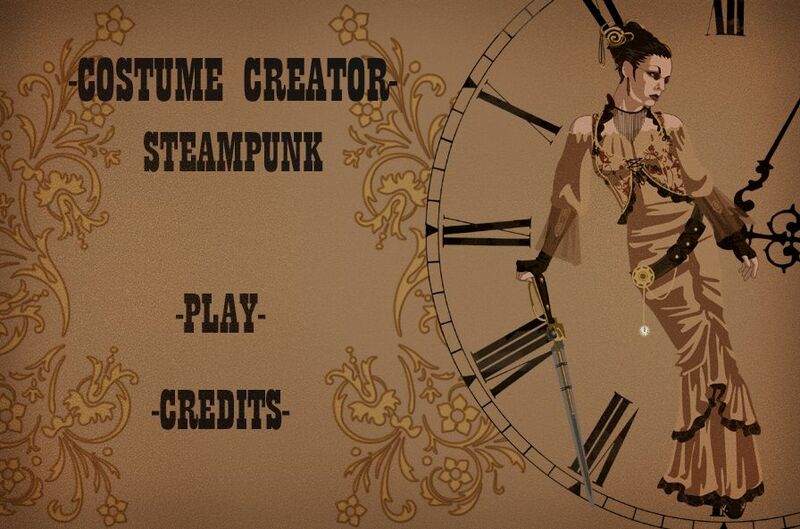 The steampunk costume creator is going to eat up MANY hours of my life, it is so awesome. And I simply cannot believe those pistols are real. Impossible. Love, love, love the steampunk Buzz Lightyear. That's just genius. Thank you for sharing so much geeky fun. 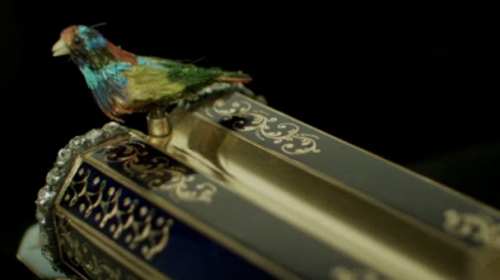 Those singing bird pistols remind me of a fairy tale I had in a book growing up. The Emperor's Nightingale? And now that I am thinking of the story, the whole mechanical nightingale replacing the real one and then eventually failing is sort of a steampunky kind of story in the first place. The illustrations in my book were more Asian inspired though. I went on your page today and I can't believe it: I'M THREE POSTS BEHIND! In the Canadian apology message, I died laughing at your aside about Texas. Look, Texas BEGS to be made fun of. Most Texans I know even make fun of themselves. So I'm sorry to hear you got reprimanded. I guess this is the thing: when you write a blog titled Cake Wrecks, anything and everything may get made fun of, and therefore someone is going to get pissed. Soooo, just know that you have a lot of faithful readers who DO support you and don't mind if we're made fun of here and there. I have a framed print on my wall that is a lovely Chinese watercolor of a cat and some flowers, and it says: "Blessed are we who can laugh at ourselves, for we shall never cease to be amused." Okay, on to this. OMG THOSE GUNS ARE AMAZING. I would totally have paid $5 million for them. That Buzz costume is great! Wouldn't a whole Steampunk Toy Story cast be wonderful? WOW. Happy 4th, everyone! WE're having a game day on Sunday--we'll be playing Settlers of Catan, LOTR Monopoly, and other geek games. So go forth and be geeky all weekend! @Costume Girl - Yes! And I love going through the photos every year. PLEASE send me links to yours after this weekend. @the viking - I'm off to look it up now! I just ran across this on Facebook and had to share. Hobby Lobby is calling steampunk "new". I'm just wondering if it's about to become trendy and mainstream, which somehow doesn't seem like a good thing to me. I'm reminded of the South Park episode, "Ungroundable", where the Goth kids were dismayed by the advent of Vamp kids, who were sort of stealing their look, but were really quite lame. This has nothing to do with steampunk, but this is a website you simply MUST know about, if you don't already. I fell in love with the Firefly/muppets prints myself, but there is all KINDS of geeky goodness on his site! Enjoy! Jen!!!! Thanks so much for this post! My daughter and my laptops are back to back on the table here and we have been spending the evening with the Costume Creator, turning our screens around, showing each other our creations - its just so much fun. 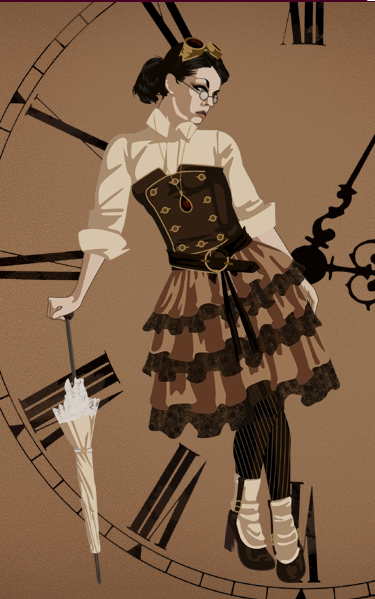 Also thanks for knowing just when I need another steampunk post to lift my mood. Thanks for this post - I just love the steam punk stuff!! Ran across this (http://vandm.com/donovandesign) the other day and thought you'd enjoy. Definitely not budget items, but some great inspiration. Wow. Those pistols are amazing! I wish I was better at making mechanisms but I lack the patience and precision. You know, I never really thought about the nightingale story as a steampunk story, but it really is. I should totally illustrate it that way one day when I have some free time, or the next time I need a gift for someone. 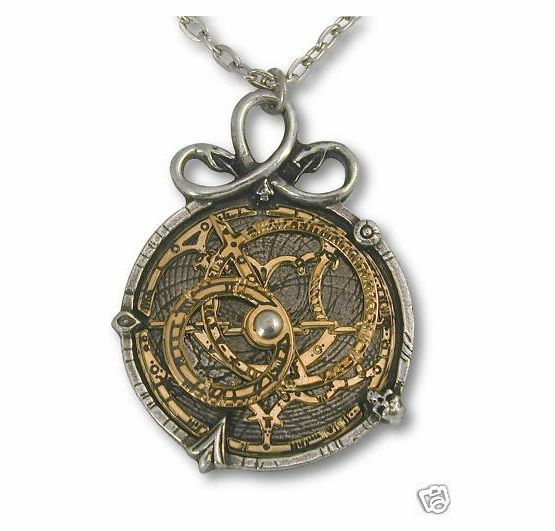 Also, am I the only one who sees the fob watch from 'Human Nature' when I look at the astrolabe pendant? Jen, I wonder whether you've ever encountered the work of Roland Emett, who was designing and making intricate automata back in the 1960s. The singing birds reminded me strongly of his work. And he was the designer of Chitty Chitty Bang Bang, which I feel is a sort of forerunner of steampunk. That steampunk Buzz Lightyear has inspired me to one day make a steampunk cowgirl ala Jessie. It would also likely be inspired by Firefly quite a bit. Hmm...The brain gears are cranking away. At first I thought the pistols were not authentic because they seem so impossible for that time period. What an amazing thing to commission and create! Jen, I read Cake Wrecks every day, and this once a week catching up in one day. I love steampunk! Here is the problem - I've read the Clockwork Angel series and am looking for a recommend on my next steampunk book. Goodreads is being wishy washy, mixing steampunk with corset rippers.